I just had to share this recipe because it’s somewhat unique. There are a variety of Lavender Syrup recipes out there but this is a recipe for Homemade Violet Syrup and Soda. Violets contain vitamin C and have a variety of health benefits: restful sleep, cure headaches and stop coughs. 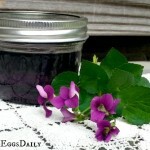 Lisa of Fresh Eggs Daily has a very simple recipe that uses fresh violets and two other ingredients. After making the syrup and refrigerating it, just add 1 to 2 Tablespoons of the syrup to club soda (or water if you prefer.) Lisa also has some creative ice cube idea. Great post! Click the How to Make Homemade Violet Soda link below to read the full recipe.